August 2012 – Avoiding "Watchful Dragons"
Since college, my favorite author has been Steven Erikson. His Malazan Book of the Fallen series is just the sort of expansive, exciting, and deeply emotional tale I like. His writing style is clipped and gritty, yet beautiful, and, on occasion, long-winded. But too much of a good thing is often forgivable, so I roll my eyes a few times every 1000+ page book and continue on to find more adventure. There is always more adventure. Always more vibrant dialogue. Always more relevant history (almost 30,000 years worth). And it always leads to a chaotic climax that put most action films to shame. Oh, and there’s one more thing: Erikson’s Malazan world is a veritable nightmare. His eighth book, Toll the Hounds, which I finished recently, is almost 1,300 pages of stinging, pummeling bleakness. It throws more darkness, more gore, and more sordid hatred at its readers than any of the first 7. Although Erikson has pushed boundaries from page one. Toll was so intense I had to put it down a few times just so I could think of something innocuous before I continued. It’s like a mental breather. It got to the point where I wondered how much more I could put up with. I told myself that the end had to be worth it despite the fact the many of his other books, while not as dark, still felt drawn toward fear in the end. I decided that I needed to see some redemption in the conclusion for the darkness to be worth it or maybe I was done with the Malazan Empire. I got my wish, and much more…and I got a little excited in my school’s library where I received a look from some girl. Thanks girl, you have no idea what I’m reading here! 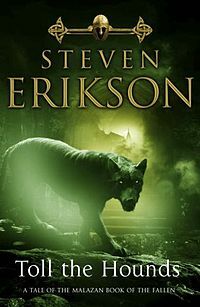 I don’t know if Steven Erikson is a Christian, but the themes at the end were overpoweringly Christ-like, and I realized that this was where the whole book aimed at. “Speak truth, grow still, until the water is clear between us,” goes the old saying of an ancient race in the Malazan world. And we end here. We walk down a road where one character forgives the only entity in the book that seemed unforgivable. Where another that didn’t need to lose anything, pays a debt and sacrifices himself for his people. And a third finally finds his home, and finds hope. And with these separate acts the water is clear and calm. The blood washes away. If you know nothing about Erikson’s books, all that will sound cryptic, but for me every ounce of bleak horror in the journey (if bleak horror could be measured in ounces) became worth it to see that climax. Many of the other books found their climax in a convergence of physical powers. The lines between good and evil were fuzzy at best throughout. But with Toll the Hounds, Erikson draws that line, and it is exactly where I hoped, but didn’t expect him to draw it. The darkness here has a purpose. And that purpose was so that the light will shine that much brighter by contrast. I was almost blinded. Between the Buried and Me – one of my longtime favorite bands – has been at the cusp of progressive music since their first self-titled album. I still remember seeing them in concert with Dream Theater and Opeth. At the time, I knew little about them. Not being a musician I guess I still don’t know much about them. But I love whatever it is I’m hearing, chaotic as it is. I like to think that I can fathom their musical patterns and follow the rhythms…I’m also a big fan of lying to myself on occasion. Anyway, as a musically challenged but enthusiastic fan – for what it’s worth – I am excited for this new EP to tie up the first part of their Parallax duo (which I can’t get enough of), and punch the boundaries of music right on the nose. Other bands that I’ve been keeping a close ear on recently include Gojira, Skyharbor and The Contortionist for their willingness to experiment. I made this blog mainly for writing/religion (serious things) purposes, but on occasion I’ll share what I’m listening to for me to check back on later and remind myself how great my music is…cause, let’s be honest, I’m the only person who gets on this blog with anything approaching frequency.